When walking a shoreline or beach, anglers must stand back from the waters edge to have any chance at all at wary snook. SNOOK FOLLOW two general seasonal and environmental patterns: warm months in nearshore ocean waters, cool months in protected inshore waters and estuaries. In the ocean, snook frequent at least four different environments: 1. Areas of structure, including downed trees and other debris as well as so-called hard-bottom locations, where underlying bedrock is exposed. 2. Beach shorelines, the best places to find cruising summer snook. 3. Jetties and piers, both of which provide high-profile structure and cover. 4. 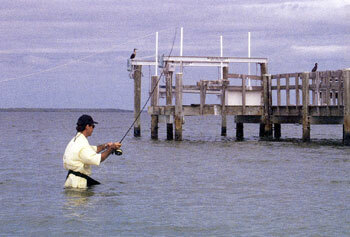 Deep passes between barrier islands, where most snook school up to spawn during the warm months. Inshore waters offer even more possibilities: 1. Mangrove shorelines. 2. Grass flats. 3. Oyster bars. 4. Bays and bayous. 5. Creeks and cuts. 6. Large rivers. 7. Ditches and canals. 8. Freshwater ponds and lakes. There is no single, easy strategy for snook. Successful snook anglers adapt their tactics and techniques to fit the conditions where they are fishing. It is valuable, therefore, to examine the characteristics of the myriad habitats where linesiders may be found. 1. Structure: For devotees of structure the first task, of course, is finding it. Sometimes this is as easy as spotting beachside stumps, trees or other flotsam and jetsam. Snook love to hide and lurk and, because of the dearth of structure in most open ocean waters, will often stack up in large numbers wherever they can find even minimal cover and camouflage. Cast as close as possible to the debris but be prepared to force the snook away from it when it hits. Hard-bottom areas in shallow, nearshore ocean waters can be some of the most productive snook spots anywhere. These rich benthic environments are full of nooks, crannies and crevices in the rocks — often porous limestone — that attract many snook prey species, both baitfish and crustaceans. When fishing over hard bottom, make long casts and retrieve the fly over as much of the dark, weedy area as possible. Some hard bottom areas are configured as narrow ridges paralleling the shoreline. If the outer edge is within casting range, cast diagonally out beyond it and strip the fly back over the dark area. Snook will often hit when the fly enters the dark zone or as it is exiting on the shoreward side. Though they can hold good numbers of snook, blowdowns and drowned forests can be very challenging to fish. Sometimes snook may be so far back in the fallen timber and brush that it takes a near perfect cast to lure them out. 2. Beach Shorelines: As previously discussed, sight fishing along beaches in summer is the most exciting kind of snook fishing. It also calls for special tactics. Because snook are among the wariest of fish, stealth is a key element of success. Understanding and following a few simple rules will dramatically increase the chances of success in sight fishing. Do not wade. Many fishermen have difficulty comprehending this so it is worth repeating. Do not wade. Snook sometimes cruise less than a foot from shore in water so shallow that their bellies are scraping bottom and their dorsal fins creasing the surface. Stay back ten or fifteen feet from the water’s edge and walk parallel with the shoreline. It is important to constantly scan the water up and down the beach, keeping a sharp eye out for movement. Out of the water, of course, snook are gleaming standouts. And to the uninitiated, it may seem a natural assumption that they would be impossible to miss. But their evanescent coloration provides excellent camouflage when they are in their element, even over a clean sandy bottom. Many anglers are surprised how difficult they can be to spot, except in the clearest water. Even large snook have a way of sneaking up on a daydreaming angler, especially if they are cruising fast. The best presentation to cruising fish is a diagonal cast. Put the fly a couple of feet in front of them and strip it away. Never, ever cast over snook from behind and strip the fly back toward them. They will spook every time. As the saying goes: Baitfish do not attack game fish. Snook know this in their genetic memory. As with most rules, there are exceptions to the no-wading imperative. On major minus tides, when water levels drop well below mean averages, some stretches of shoreline will be paralleled by shallow channels bordered on their outer edges by barrier sand bars. At these times it can be very productive to wade out to the bar and walk in one direction or the other, scanning both its outer and inner edges for signs of fish. When casting to docks and piers, stay well back from the structure, and try to cast as far up under it as possible. 3. Jetties and Piers: These man-made structures are snook magnets. The reason, of course, is that they provide cover for both snook and their prey. Piers are especially good spots because they offer overhead protection and shade. When fishing jetties, a long cast parallel to the structure offers the best chance to lure out a fish. Cast as far under piers as possible, working the fly close to pilings. Zero in on sections of water that lie in shadow. The same caveat that applies when fishing other structure is also valid for jetties and piers: Try to turn the fish’s head immediately and force it out into open water. 4. Deep Passes: Fishing large passes presents a special challenge because of the water depth in many of them. Try spotting surface fish first by looking for nervous water or battered baitfish. I always prefer to try a floating line first. But if there is no surface action, switch to an intermediate or full-sink line and a weighted streamer and go deep. Snook may be anywhere in the water column. Often they will hit as the fly is stripped up to the surface. Working the dropoffs and margins can be highly effective, especially where the bottom transitions from sandy depths to grassy shoals. Also, any areas of rip-rap or other erosion control structures can produce phenomenal results. One of the best examples of this is the boulder-lined south shore of Redfish Pass, between Captiva and North Captiva Islands in southwest Florida. Especially in summer, it can seem as if there is a snook lurking in every rocky niche. 1. Mangrove Shorelines: This is snook fishing as most people know it. Almost always done from a boat, it usually involves blind casting to root-tangled margins, though there may be occasional sight fishing in sandy pockets and shallow areas. When fishing mangrove shorelines, just as when working a trout stream, it is important to learn to read the water and spot likely lies: under overhanging branches, in tidal cuts, deep within dark pockets and shoreline indentations. The technique of prospecting with flies is an effective and time-honored method, though on tough days there can be a lot of casting between fish. Most mangrove shorelines are shallow, so this method is not effectual on very low tides. And on extreme high tides it can sometimes be frustrating to hear snook busting bait deep within flooded forests, beyond hope of any cast. The most productive times are the last three hours of the incoming and the first three hours of the outgoing tide. Cast as close as possible to the mangrove roots and keep the boat at least forty or fifty feet from the shoreline (the farther out the better) to avoid spooking the fish. Many fishermen use a trolling motor to work a shoreline, but a push pole offers more stealth. Watch and listen for feeding fish. A snook busting bait at the surface makes a very distinctive sound, a “plock” that is a combination of a pop and a hard smack. Once you have heard it a few times you will be able to distinguish it from ladyfish, sea trout, mangrove snapper, etc. Cast as tight to the mangroves as possible. There is a saying among snook anglers that if you are not getting hung up you are not casting close enough. If the fly does catch on a branch or a bunch of leaves, be gentle in trying to get it free. Remember, as in life, when prospecting the mangroves patience is a virtue. Take your time in working a particular stretch. Beware of adopting “the grass is always greener” attitude that prompts anglers to haphazardly fish an area and rush on to the big fish they are sure must be around the next bend or mangrove branch. 2. Grass Flats: On grass flats, snook can be found cruising for baitfish and crustaceans in the same areas as sea trout and redfish. This is partly sight fishing. Look carefully for wakes and signs of nervous water. 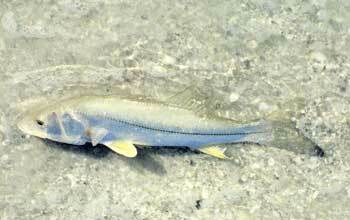 Occasionally, but only occasionally, snook will tip down to eat shrimp or crabs, exposing their tails as redfish do. Like reds, they will cruise in over the flats on an incoming tide and move back out when it falls. Despite the sometimes very shallow water (six or eight inches is enough), snook can be very hard to spot in the grass. And they are extremely spooky. When fishing from a boat, be ready to make long casts — they can pick up the pressure wave from even a carefully poled boat thirty or forty yards away. Wade fishermen should move slowly and step carefully, trying to avoid crunching shells underfoot or splashing. Also, most grass flats are dotted with sandy potholes that draw snook and other fish, especially at the lower end of the tide. On a fast-falling tide snook and other fish will often follow any little channel to deeper water. Do not attempt to use a trolling motor when fishing a grass flat. Even this minimal “white noise” echoes across shallow-water flats like a gunshot in a box canyon. 3. Oyster Bars: Many oyster bars have existed for decades or longer, creating impressive structure masses. These honeycombed accumulations of generations of shells attract baitfish, shrimp and crabs and, inevitably, the birds and game fish that prey on them. Most oyster bars are surrounded by a ring of deeper water — analogous to a castle moat — and this is where the snook will be, cruising the edges of the shell heap. Usually these rings will have one or two (comparatively) deep pockets where snook will also lie in wait. As on the flats, keep an eye out for nervous water and also watch the wading birds — herons, ibises, egrets, etc. They will often pinpoint the greatest concentrations of bait. Oyster shells can be as sharp as razors and will slice through a leader in a split second. If you hook up, force the fish away from the shell mass immediately. Some oyster bars eventually develop into tiny mangrove keys. Any portion of the surrounding that is shaded by the trees is a likely snook hangout. 4. Bays and Bayous: These bodies of water are actually brackish water ponds and lakes. They are almost always bordered by mangrove shorelines and this is where anglers should focus most of their efforts. But it is also a good idea to prospect holes and channels. Snook will generally not sit in the middle of these deeper areas, but will prowl edges and dropoffs where water depth changes dramatically over a short distance. Not all bays and bayous are created equal. Water flow, bait populations, and other factors vary widely depending on a number of factors. Some are virtually landlocked and others have numerous inlets and outlets. Also, depending on their orientation, the direction of the wind and the stage of the tide, two bordering bodies of water may have completely different fishing on a given day. If you do not find action in one, do not assume that the adjacent one or one not far away will also be fishless. 5. Creeks and Cuts: When fished on strong moving tides, these can be extremely productive snook spots. The best fishing is generally on a steep falling tide, when baitfish, shrimp and other snook foods are swept out of the estuaries. Tactics for catching snook in creeks and cuts are similar to those used in streamer fishing for trout. Cast down and across the current, letting the fly swing and stripping it back against the current. Slow and easy are the bywords for the retrieve. The current alone will usually impart sufficient action to the fly. Sometimes it is effective to stop or delay the retrieve, twitching the rod tip occasionally to mimic a baitfish scooting forward and falling back against a strong flow. Even with a slow retrieve, in very swift tidal flows an unweighted streamer will sometimes ride too high. If the fly skips along the surface during the retrieve, switch to a weighted fly or a sinking line. One type of cut that can be phenomenally productive is culverts. In general, the larger the bodies of water they drain the more productive they will be. Especially on strong outgoing tides, these narrow tunnels concentrate a strong flow into a torrent. Naturally they also concentrate the schools of bait that move through them. 6. Large rivers: Large rivers — such as the Caloosahatchee in southwest Florida and the Indian River in east central Florida — are extensive marine ecosystems whose habitat variables are largely determined by the complex interplay between outflowing freshwater from inland regions and tidal saltwater from the ocean. These major waterways contain elements of many different sub-environments for snook: i.e. mangrove shorelines, grass flats, creeks, bays, etc. In addition to the usual seasonal climate variables, the quality of their fisheries is determined by a combination of natural and human factors largely associated with adequate but not excessive water flow and nutrient load. Especially during the changeover seasons — spring and fall — the mouths and lower reaches of large rivers can offer phenomenal snook fishing. The most action is often found in the rich interflow zones, where fresh and saltwater mix. These areas move upstream or downstream according to the relative strengths of tidal flows, rainwater runoff and reservoir releases. During periods of high river flows there will frequently be a clearly visible line of demarcation where fresh and saltwater meet at a river mouth. Often the boundary is marked by a narrow surface strip of foam and weeds that is as distinct as any chalk yard marker on a football field. Fishing this band can sometimes bring a snook bonanza. The best fishing comes when there is a strong incoming tide surging in against the outflowing river water. At these times large schools of baitfish that have been swept downriver may become trapped in stasis between the opposing flows: They cannot break free to head upriver or out to sea . Small baitfish, especially, are virtually helpless against the buffeting whims of strong currents. A little research and reconnoitering can be a boon to river mouth angling success. Tide charts make it easy to pinpoint the times with the steepest climbing tides. Rips are also top-notch river mouth snook spots. These are areas where water surges up from a deep channel over a shoal. Snook cruise the shoal’s upslope, attacking concentrations of bait caught in the upsweeping current. Also, there are almost always snook under and around highway and rail bridges. Fish close to the pilings and, during the daylight hours, in shaded areas. At night, baitfish and snook also concentrate in the glow of lights. 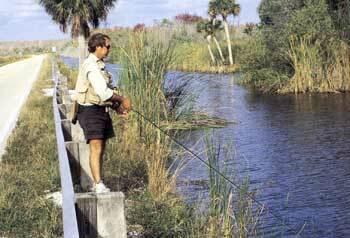 Ditch and canal fishing, such as here along the Tamiami Canal, is a quirky, intriguing pastime. 7. Canals and Ditches: At their best, these generally small waterways mimic the natural habitats of creeks and rivers. At their worst they are sterile, concrete-lined spillways. Most fall somewhere in between. Ditches and canals are reliable and often highly productive havens for winter snook. If the water is relatively clear, snook can often be spotted cruising the edges or lying in wait near docks and seawalls. In discolored water, they can be found by watching for bait pods and by sound when they attack baitfish on the surface. As in cuts and creeks, the time to fish for them is on moving tides. Slack water fishing is nearly always a waste of time. Perhaps the best known ditch/canal system for snook fishing is the complex of creeks and drainage trenches along and near the eastern end of the Tamiami Trail, from Naples, Florida, to the Turner River Canal. These quirky, intriguing waters — pioneered by legendary fly fishers including Lefty Kreh, Charles Waterman, and Joe Brooks — are easily accessible and have good numbers of snook, especially in winter. Several fishing buddies and I have had some of our best winter snook fishing days in this region. Junctions of ditches and canals are especially good places to find snook. So are the outflows of gullies, and shallow streams that drain mangroves and marshes and empty into larger waterways. Do not ignore even the smallest trickles. Bridges are also good. Two quirks of this fishery are the large numbers of alligators and, in most areas, speeding cars and trucks only a few feet away. Both factors call for an extra measure of caution when fishing. But the byword in gator country is caution, not fear. As with other apex predators (i.e. grizzly bears, sharks, mountain lions), the biggest gators may view humans as merely part of the food chain, like the raccoons, deer and wild hogs that are also part of their diet. These prehistoric armored lizards are not marauding monsters, but most of us who fish in areas where they live have dodged a few over the years. Following a few simple rules will help keep you safe. Because of the Everglades ditches’ proximity to the highway, snook anglers sometimes employ the unusual tactic of car cruising: Driving slowly while watching the waterways for snook busting bait. Lefty Kreh says he often did it with various fishing buddies in the old days of Everglades ditch fishing. “There was a cadre of about twenty guys,” he says. “What we would do, one of us would sit on the right fender of the car and one of us would drive. And the guy on the fender would have a fly rod ready to go.” When they spotted snook or tarpon moving, they would drive on past, pull over and stop, and fish back to the schools. These days Kreh chuckles recalling it. In the summer snook numbers dwindle in the ‘Glades ditches as many migrate out of inland waterways to large bays and the Gulf of Mexico. Fierce swarms of bloodthirsty insects are another warm-weather disadvantage. 8. Freshwater Ponds and Lakes: Like some other saltwater fish species (i.e. striped bass), snook adapt well to freshwater. They can be found in some surprising places, from golf course water hazards to sweetwater bayous and large lakes. One well-known place where they are caught is south Florida’s Lake Okeechobee, the state’s largest freshwater body of water. Because they need strong tidal flows and high salinity levels for successful spawning, snook do not reproduce in freshwater. But once introduced they can survive for decades.